REASON TO WATCH So you love animals, but you’ve seen too much too-cute and too many monsters from hell? Here’s the TV tonic — military working dogs who will make you salute, before they rip your heart out. 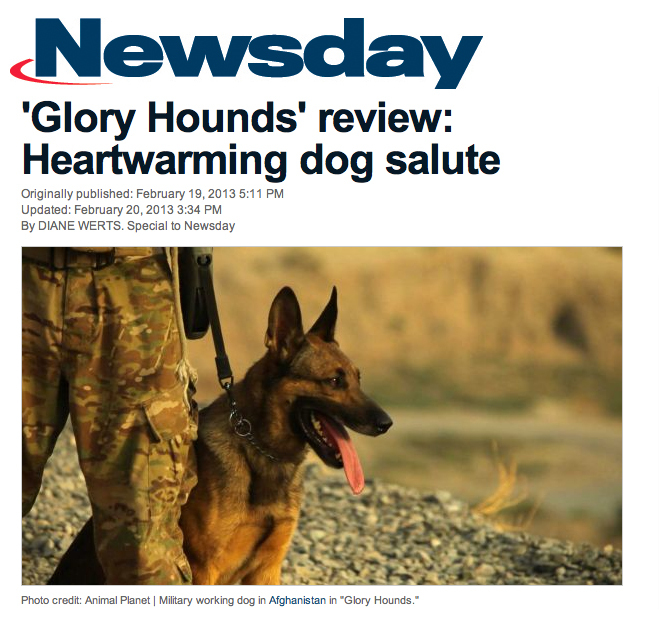 WHAT IT’S ABOUT It’s a two-hour ride-along — patrol-along, really — with four teams of soldiers and their canine partners, hitting the ground in Afghanistan to sniff out improvised explosives and hidden humans. Narration tells us a dog like this “helped track down Osama bin Laden,” but we’re persuaded enough by seeing these dogs’ daily duties. The four teams’ unfolding stories gradually weave a you-are-there tapestry of missions and downtime, helmetcam footage and Skype-calls home, shocking blasts and nail-biting consequences. Warning to vulnerable viewers: Halfway through the program, one team suffers a fatality. Soon after, another endures a grenade hit. These filmmakers know what they’re doing. Directors John Dorsey and Andrew Stephan (ESPN’s “30 for 30” film “Pony Excess“) delicately handle the disasters met — not just by the MWD teams but by their own sound and camera guys, who equally face a bloody tourniquet-and-prayer test. They know how much to say, and show, to viscerally deliver the sights, sounds and even smells, without scaring us away. While Dorsey and Stephan lay careful groundwork for all that follows, they evoke emotions by playing it straight, letting warmth and poignancy develop on their own. BOTTOM LINE By the time there are homecomings, you might feel a tear or two. And a smile or ten.